Prime Minister Winston Churchill, behind his desk in the British War Office at Whitehall, London, was in a foul mood. The date was June 20, 1944, two weeks after the Allies had landed in Normandy, on June 6. Outside his window the worst storm in fifty years was raging over Great Britain and the English Channel,a storm so violent that it could conceivably destroy the Anglo-American OVERLORD beachheads on the coast of Normandy. The fruits of years of preparation were in greater peril that day than they had been on the better-remembered D-day itself. General Dwight Eisenhower and Prime Minister Winston Churchill inspect preparations for the D-Day invasion. In Churchill's office, for a short visit, was my father, General Dwight D. Eisenhower, with me present as an aide. Dad and I had been planning to visit OMAHA Beach, in Normandy, the day before. Now we found ourselves marooned in Dad's "Telegraph Cottage" south of London, incapable of taking any action whatsoever. Frustrated at his enforced isolation, Dad decided to drive up to London to see Prime Minister Winston Churchill. After minimal greetings, all three of us sat down at the large table in Churchill's office and said little except for Churchill's fretting over the situation. He slouched in his chair, glaring at the floor. "They have no right," he growled, "to give us weather like this!" So sure was he of the rightness of the Allied cause that he took this storm as a personal affront on the part of the Almighty to himself. No business of any substance was discussed. The two men, British prime minister and Supreme Commander, were there primarily as friends, taking comfort in sharing their common frustration and to draw strength from each other. What I remember most about the incident is the ease with which they communicated. The personal bond between them would never falter, even though the differences in their official positions and conflict between national interests would sometimes cause them to be rivals for power. What I remember most is the ease with which my father and Churchill communicated. The personal bond between them never faltered. The incident I have described above occurred toward the end of their close association. Eleven months later Hitler committed suicide, and Germany surrendered. It had taken a long time to reach this level of intimacy. Churchill's ties with the Americans, however, especially with President Franklin Roosevelt, had begun well before that. The Anglo-American alliance of the Second World War did not occur by chance; it was to a large extent the product of Churchill's will and determination. Americans in general were opposed to entering the war. So it was up to Britain to woo them. The courting began formally in April 1940, when Churchill was called from the political wilderness to be first lord of the admiralty. He took the initiative when he wrote Roosevelt a letter in which he proposed a private correspondence on "naval matters." Somewhat disingenuously, he hinted that, as first lord in the First World War, he recalled meeting Roosevelt, who had been assistant secretary of the Navy in the United States. Roosevelt had welcomed the idea of a correspondence, and encouraged it even more when Churchill was elevated to the position of prime minister in May 1940. By coincidence Churchill came to power on the very day that the panzers of Adolf Hitler launched the blitzkrieg on the western front that resulted in the French surrender and the evacuation of the British Expeditionary Force from Dunkirk across the channel back to Britain. Britain itself was left alone, largely disarmed and protected only by the Royal Navy and the Royal Air Force. If Churchill had ever harbored any doubts of Britain's dependence on the United States, he lost them at that time. Roosevelt proved to be an easy mark for Churchill's flattery and blandishments. He and his wife, Eleanor, were Anglophiles, having hosted the British king and queen at the White House in 1939. Convinced that Britain must survive the war, he did everything politically possible to aid Britain within the limitations imposed by a reluctant American public. In September 1940 Roosevelt signed an executive order transferring fifty "obsolete" American destroyers to Britain in exchange for the use of some naval bases in the Caribbean. In early 1941 he pushed through Congress the Lend-Lease Act, which essentially absolved Britain from paying for the growing supply of armaments the United States was providing them. In August 1941 Churchill and Roosevelt met at Naval Station Argentia in Newfoundland. The American military base was one of eleven leased from Britain in exchange for 50 destroyers. Although not yet formally in the war, the U.S. was "neutral on Britain's side." In August 1941 the two national leaders met at Argentia, Newfoundland, flashing a message to the world that the United States, though neutral in the European conflict, was "neutral on Britain's side." American and British military staffs began joint planning for the day when the United States would enter the war. By later that year, American warships were exchanging fire with German submarines in the North Atlantic. In effect, the Japanese attack on Pearl Harbor on December 7, 1941, and Hitler's declaration of war three days later were merely confirming a situation that already existed. America was already in the war. Churchill had long been anticipating the day, and he had already laid his plans for an early conference with Roosevelt. He now had a reason for extra urgency: the Americans might change plans and put their strength against Japan, not Nazi Germany. He wheedled a reluctant invitation from Roosevelt, and on December 12, 1941, he and a large staff left Scotland destined for the United States. While at sea he sent a single message to Roosevelt asking him to reaffirm the previously agreed-on principle of "Europe First." On receiving a quick affirmative reply, he knew that he had already accomplished his most urgent aim. Churchill's party arrived at Hampton Roads on the evening of December 22, and a plane was waiting to fly him to Washington, where Roosevelt and his right-hand man, Harry Hopkins, were out at the airport. Roosevelt invited Churchill to stay as a personal guest in the White House. Churchill's main aim now was to make friends with Roosevelt, and the president reciprocated, going all out to accommodate his guest. The two quickly became personal friends. Too much so, it was reported, for the taste of Eleanor Roosevelt, who was uncomfortable over the late hours her husband was keeping in playing the genial host. Another unhappy person was General George Marshall, the American Army Chief of Staff, who feared that the persuasive Churchill might lure Roosevelt into participating in ventures of solely British interest, not desirable to the Americans. Marshall's discomfiture was heightened by the arrival of Churchill's portable war room, which to Roosevelt's delight was set up in the bedroom right across from Churchill. British officers, carrying impressive red briefcases, had free access to the second floor of the White House, while the American staff was disbarred. Roosevelt subsequently set up a war room of his own. Churchill himself was also under great strain. He was forced to tolerate the large Roosevelt family bent on celebrating a large, happy Christmas despite the war. He was also called on to speak at the traditional lighting of the national Christmas tree on the Ellipse. But he drew the line at the Christmas dinner. He left early to prepare a speech to the joint session of Congress. The next day Churchill and his physician were driven to the Capitol to address Congress. He went with trepidation, worried about the reception he would receive. Unlike many of his countrymen, who still thought of the Americans as merely "transplanted Englishmen," he knew better. Further, he was still haunted by the fear that the members individually represented constituents whose thirst for revenge on Japan might tempt them to ignore the European Theater. Churchill's worries turned out to be unfounded, however. The American senators and congressmen vied with each other to laud him. 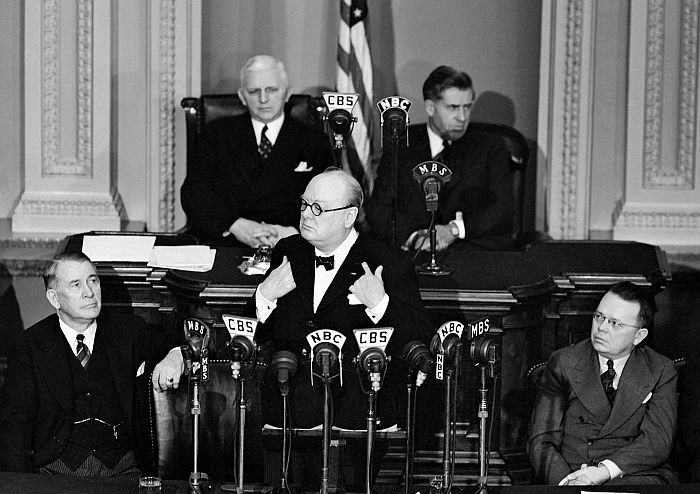 Churchill speaks to Congress on December 26, 1941. In the following days, Churchill, Gen. George Marshall, and their staffs began in earnest to plan the war's military organization. What sort of people do they [the Axis powers] think we are? Is it possible they do not realize that we shall never cease to persevere against them until they have been taught a lesson which they and the world will never forget? He must indeed have a blind soul who cannot see that some great purpose and design is being worked out here below, of which we have the honor to be the faithful servants .... The best tidings of all is that the United States, united as never before, have drawn the sword of freedom and cast away the scabbard. That concise summary of Allied war aims, though inspirational, was overshadowed by some words spoken at the beginning. Referring to his American-born mother, he remarked, "I cannot help reflecting that if my father had been American and my mother British, instead of the other way around, I might have got here [into the American Congress] on my own." Such flattery struck a responsive chord. From that time forward, not only the Congress but Americans in general looked on the British prime minister as one of their own. "What sort of people do they [the Axis powers] think we are?" Churchill asked Congress. "Is it possible they do not realize that we shall never cease to persevere against them until they have been taught a lesson which they and the world will never forget?" Following the Christmas celebrations and Churchill's address to Congress, the code-named ARCADIA conference settled down in earnest. They were breaking new ground in history. Two strong, proud nations, sharing resources though lacking any formal treaty between them, were now planning ways to employ those resources. Most of the issues fell into the sphere of the military organization, in which the Army Chief of Staff, George C. Marshall, dominated. His greatest accomplishment was to establish a system of theater commands around the world, each consisting of troops from all the services of the Allied nations involved. Some British officers resisted the idea, but Marshall, as an enticement, proposed that the first theater commander should be British general Sir Archibald Wavell, who would command all the American, British, and Dutch forces fighting Japan in the Far East. Possibly aided by that carrot, Marshall finally won his point. The ARCADIA Conference had set up procedures and, more important, had affirmed the Anglo-American plan to concentrate the bulk of their forces on what they considered their main enemy, Nazi Germany, and only when Hitler was destroyed turn their combined might on Japan. 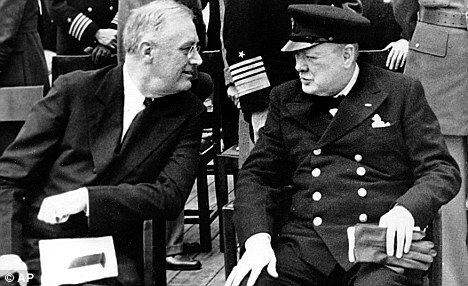 Churchill and Roosevelt had not seriously discussed how the war in Europe would be fought. Would the Allies invade France, and if so, when? It was here that Churchill, armed with a vital geographical position -- Britain -- and experienced staffs, virtually dictated the way the European war would be fought. This he managed so deftly that the people of both Britain and the United States had the impression that everything had always gone smoothly, according to a previously agreed-upon plan. Such was far from the case. In his dealings with the Americans, Churchill always downplayed the fact that British and American war aims were far from identical, emphasizing their partnership as allies against Hitler, Mussolini, and Japan. And so they were. What he seldom emphasized was his determination to preserve the already shaky British Empire, which spread from England, and included Gibraltar, India, Malaysia, and Hong Kong. Americans had no interest in Britain's empire; in fact, our anticolonial tradition gave Churchill little or no sympathy in his effort to preserve it. But they, like the British, tried to brush that issue under the rug unless, as Marshall in particular feared, American troops would be employed to that end. The result was a dichotomy of concepts. Churchill conceived defeating Hitler by first securing the Mediterranean and then squeezing Hitler's Western Europe in a gigantic ring. (One of the six volumes of Churchill's memoirs was named Closing the Ring.) The American Joint Chiefs of Staff, to whom Roosevelt delegated all but the momentous decisions, wanted to cross the English Channel from Britain at the first possible moment. The issue was not immediately addressed on Churchill's return to London because the planners had other things on their minds, trying to send troops and supplies to their meager forces in the Pacific that were falling one by one to Japanese power. One by one, Singapore (which fell while Churchill was in the United States), Hong Kong, Malaysia, and the Dutch East Indies eventually fell to the Imperial Japanese Army and Navy. But the Americans, especially Marshall, wanted action, and Marshall initiated it as early as April, even before the fall of Corregidor. Marshall's staff worked almost around the clock, fighting the war with Japan and at the same time planning for extensive operations in Europe. The overall plan broke down into three phases—or two and a half. The first was a buildup of United States forces in Britain (BOLERO). The second was to launch an invasion of France from Britain in 1943 (ROUNDUP). The third was a long shot, a high-risk attack across the Channel that very same year, 1942 (SLEDGEHAMMER). The last of these was the issue at stake. BOLERO was a basic requisite, and ROUNDUP, Marshall's "Holy Grail," was a year off. SLEDGEHAMMER, if it could be sold, was designed to take the heat off the beleaguered Russians, who were reeling under vicious German attacks in the Caucasus. Russia must not be allowed to fall. Roosevelt was not immediately convinced. But his respect for Marshall was so great that he was reluctant to turn down the chief of staff's plans arbitrarily. He therefore took the easy way out: he ordered Marshall and his staff to sell the program to Churchill. Roosevelt himself would stay in the background, playing the role of arbitrator. On April 4, 1942, Marshall and Harry Hopkins, Roosevelt's unofficial right-hand man, flew from Washington to London to meet with ChurchilI and the British military. When they landed in London on April 8, they were surprised to find Churchill himself at the airport to meet them. They were about to begin their education in how Churchill got his own way. It seems inconceivable that Churchill would ever give SLEDGEHAMMER serious consideration. But he did not say no. He invited Hopkins to stay with him, and during the next few days Hopkins conferred with Churchill. Marshall, on the other hand, concentrated on the British Chiefs of Staff (BCaS). This arrangement gave Marshall one great advantage: he was spared the ordeal of conforming to Churchill's late nights. Hopkins, though also a night person, was outclassed. There was only one bad moment, and it had nothing to do with war planning. On Saturday night-or three o'clock Sunday morning, April 12- the conviviality was interrupted by a message from Roosevelt in which the president offered no sympathy for the failure of the so-called Cripps Mis­sion to India. Once the invasion of North Africa in the fall of 1942 was agreed upon, a commander had to be selected. But who? Oddly, Roosevelt and Churchill quickly decided that he would have to be an American, because the Vichy French occupying Morocco and Algeria had not forgotten Churchill's sending the Royal Navy into Oran Harbor and destroying the French fleet to prevent its falling into German hands after the French defeat in 1940. Many American generals were possibilities for the post, but Lieutenant General Dwight D. Eisenhower was already on the spot as commanding general of U.S. Forces in Europe. Eisenhower was young—not yet fifty-two years of age—and he lacked experience in high command, but Marshall placed a great amount of trust in him and he quickly convinced Roosevelt and Churchill that Eisenhower was the best choice. So Lieutenant Gen­eral Dwight D. Eisenhower was appointed as Allied Force commander for Operation TORCH. Churchill, in his memoirs, called the summer and early fall of 1942 "the most anxious months." The two allies were preparing for a high-risk inva­sion, the largest in history up to that time. Secret messages as to the locations of the landing areas flew back and forth across the Atlantic. Eisenhower, though carrying the title of Allied Commander, was not himself authorized to choose the landing sites. Yet as Churchill discussed his differences with the Americans in Washington, he sensed a partner in this man from Kansas, who saw the problems very much as he did. At one point Churchill recom­ mended coming to Washington and bringing Eisenhower with him. Their personal relationship became close, and strict protocol did not always gov­ ern, as when General Mark Clark was planning his clandestine submarine trip to Algeria. Eventually, plans fell into place, and on the morning of November 8, 1942, five landings were made in North Africa, three in Morocco (Safi, Casablanca, and Port Lyautey) and two in Algeria (Oçran and Algiers). The landings were made safely, but many things went wrong from the start. The Vichy French officers felt that their honor as soldiers compelled them to resist. Fortunately, however, the Vichy French defense minister, Admiral Jean-François Darlan, visiting Algiers, fell into Allied hands. Eisenhower made a controversial arrangement with him, whereby the French, under him as governor, would stop fighting the Americans and British and join them against their real enemy, the Germans. TORCH had assumed a quick seizure of Tunisia, but that expectation soon faded. The Allies had expected Hitler to withdraw from North Africa. Instead, he decided to stay and defend. The foul weather contributed, and the supply lines were long and rickety. With the hope for a quick, peaceful occupation of Tunisia gone, any chance for the attack on Northwest Europe (ROUNDUP) in 1943 was for all intents and purposes dead. Churchill's "ring" was essentially established. 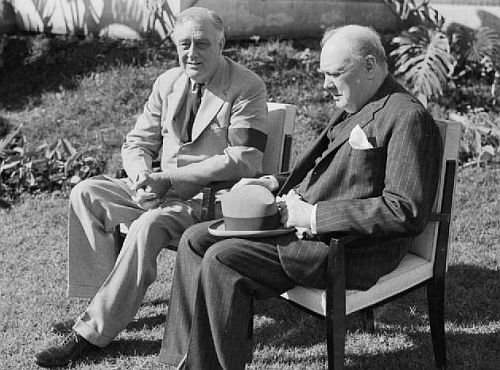 With the Allies in control of Morocco and Algeria, Roosevelt and Churchill now decided to hold another conference, this time someplace other than Washington. They also hoped that Russian premier Joseph Stalin might join them, but on his refusal the two Western leaders determined to meet at Casablanca in January 1943. Their joint effort began a new phase in Allied planning. The Allied meeting at Anfa, near Casablanca, French Morocco, was fraught with drama. Although it was kept secret at the time, it caught the public imagination later. Amid the freezing winter at home, two immensely popular leaders were meeting to make great war plans in the warm, luxu­riant atmosphere of Morocco. In making the trip, Roosevelt was breaking new ground: no American president had ever flown in a plane while in office, nor had any left the United States during wartime. And by coincidence the block-busting motion picture Casablanca was released at that time. Churchill and the BCOS were the first party to arrive at Casablanca after a dangerous, uncomfortable flight. The American Joint Chiefs arrived soon after. While the military men conferred, Churchill relaxed and swam in the surf. When the president's party arrived on the evening of January 14, Roosevelt invited everyone, political and military, to dinner at his villa. It was an auspicious beginning. For the two political leaders, the few days spent at Casablanca provided a welcome rest, their leisure enhanced by the determination of the military to work their problems out by themselves. The issues at stake generally centered around troop levels, or, more specifically, the allocation of American forces between Europe and the Pacific. The two main antagonists in the ensuing hassle were General Sir Alan Brooke and Admiral King. But the main conclusion was clear. It was now impossible to invade France from the United Kingdom in 1943. The recommendations of the Combined Chiefs of Staff (CCS), therefore, were (1) to maintain the war against the German U-boats in the Atlantic, (2) to continue the aerial bom­bardment of Germany, and (3) to continue to supply the Russians as well. At one point, an angry Alan Brooke threatened to break off negotiations. Sir John Dill came to the rescue when he warned Brooke that the matter would have to be submitted to Roosevelt and Churchill. "You know," Dill warned, "what a mess they would make of it." The main issue, the one that Churchill cared most about, however, was the agreement to "occupy" Sicily after the fall of Tunisia. As a hollow concession to Marshall, the Allies agreed "to assemble strongest possible force in constant readiness to re-enter the continent as soon as Germany is weakened to the required extent." Churchill had once more carried the day." Important as were the decisions made at Casablanca, the event is re­membered chiefly for the cosmetic show of unity between the two French generals, Charles de Gaulle and Henri Giraud, each of whom aspired to be the head of the provisional French Republic for the duration of the war. By force of circumstance, the Americans supported Giraud and the Brit­ish supported de Gaulle, who was a particular anathema to Roosevelt. But the two Frenchmen respected each other, despite their rivalry, and at the end of the meeting they consented to be photographed together in the garden of Roosevelt's villa. With their respective sponsors beaming, the two Frenchmen stood up from their chairs and, on cue, shook hands. Wags in the press called the stiff but cordial handshake "the shotgun marriage." The episode came to nothing. It was that same press meeting, however, that showed Churchill's will­ingness to accord Roosevelt the center stage in public. On an impulse Roosevelt declared to the press that the Allies would accept no terms for an end to the war except "unconditional surrender" on the part of the Axis powers. Churchill later claimed that he had not been consulted in the dec­ laration, but he nodded his approval. The rhetoric meant little to him. He had achieved agreement to go into Sicily after Tunisia. Beyond Sicily, only a few miles away, lay Italy. The British lifeline to India through Suez was now Virtually ensured. The Casablanca Conference over, Roosevelt and Churchill decided to relax just a little longer, and they drove down the heavily guarded two-lane highway to Churchill's favorite vacation spot at Marrakech. There they stayed in the home of an American, Mrs. Moses Taylor, a rabid Republican who for patriotic reasons allowed the leaders to use it. 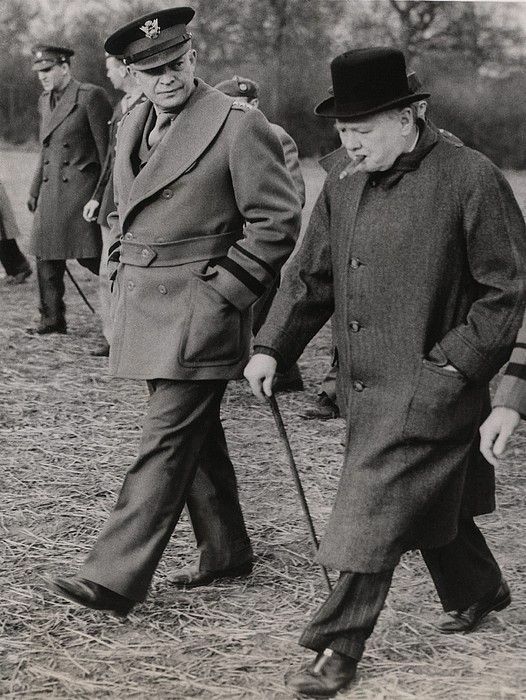 The next morning Churchill impulsively jumped out of bed to accompany Roosevelt to the airstrip for his takeoff home. As the plane left, an aide heard Churchill murmur, "If anything happened to that great man I couldn't bear it. He is the greatest man in the world today. Come, Pendar, let's go home. I don't like to see them take off." That moment represented the high point of the Anglo-American alliance of the Second World War. In one more arrangement, Churchill stuck to his policy of giving the Americans the titles while keeping power in British hands. Two weeks before the Northwest Africa bombings, General Bernard L. Montgomery's Eighth British Army, under the overall command of Sir Harold Alexander, had sent Rommel reeling at El Alamein and would soon arrive in southern Tunisia after pursuing Rommel across the Libyan Desert. When that hap­pened, Alexander would be crossing from what had been designated as the "Eastern Mediterranean" into Eisenhower's "Western." Alexander out­ranked Eisenhower by a full grade and was far more experienced. When they met, who should command? Once again, Churchill came up with a scheme by which he could publicly defer to the Americans while keeping real control in his own hands. Since the combined forces would now be operating in Eisenhower's terri­tory, Ike should stay on as overall commander of the theater. But Churchill insisted that Eisenhower's three top subordinate commanders would be British: Alexander for land forces, Sir Arthur Tedder for air forces, and Andrew Cunningham for naval forces. At Casablanca Roosevelt accepted the arrangement, apparently without undue comment. Churchill had a policy of giving Americans the titles while keeping power in the hands of British military as much as possible. Eisenhower was understandably pleased to be retained in his position in view of Alexander's qualifications, but he resented the designation of his principal subordinates and also the press announcement of it. Ameri­can practice has always given the commander the right to choose his subordinates, not to have them dictated to him. Churchill had originally promised to keep the arrangement out of the public eye, but of course it leaked. Eisenhower recognized Churchill's scheming, and he did not for­get it. Fortunately, his relations with all three British officers so designated were friendly, even warm. Tedder in particular became his chief advocate, and Cunningham was right behind him. On May 13, 1943, nearly three months to the day from the last day of the Casablanca Conference, 350,000 Germans and Italians surrendered to the British and Americans in the northern tip of Tunisia. It was a great haul, more men than had surrendered to the Russians at Stalingrad. The prisoners were tough soldiers, and though there were more Italians than Germans, the loss was a blow to Hitler's Wehrmacht. For the Allies it was already decided that the next Allied objective should be the occupation of Sicily, and the question again arose-what next? The answer was a foregone conclusion. Italy lay next door, just across the Strait of Messina from Sicily. Despite Marshall's aversion to operations in the Mediterranean, it was practically inevitable that the lateness of the year precluded any action in northern Europe. Failure to pursue the war in the Mediterranean would leave many Allied divisions idle for months, a nearly intolerable situation for the troops. After another meeting in Washington to discuss the issue, Churchill then secured Roosevelt's permission to take Marshall to visit Eisenhower in Algiers, and the invasion of Italy was settled. In August 1943, Roosevelt and Churchill met with their military staffs at Quebec. The significance of the QUADRANT meeting was far-reaching in that it began serious, concrete planning for the invasion of Northwest Europe in May 1944. A special group was organized under a British officer, Lieutenant General Sir Frederick Morgan, to begin drafting the detailed plans, subject to agreed-upon parameters as to resources. Morgan was given the exotic title COSSAC (Chief of Staff to the Supreme Allied Com­mander). The Supreme Commander to whom General Morgan was to be "chief of staff" was not named. On the first evening of the Quebec Conference, Churchill received an unwelcome, though perhaps inevitable, ultimatum from Roosevelt: the commander of the forthcoming Allied invasion (OVERLORD), Roosevelt insisted, would be an American, not a British, officer. The development came as something of a shock to the egocentric Sir Alan Brooke. By reason of their long opposition to Hitler, the British had considered themselves as the senior partners of the alliance. North Africa they had considered a necessary sideshow. There was no doubt at this point that they had been replaced. The military operations of the summer of 1943 went satisfactorily, though not without troubles. National attitudes did not change. Churchill continued to take increased interest in the Mediterranean command, while Mar­shall resisted sending another man, another tank, or yet another bullet to the region. But for Churchill, a source of dismay was in the offing: Roos­evelt's obvious decision to begin courting the friendship of Soviet Russia, especially Joseph Stalin, at Churchill's expense. Roosevelt's decision to court Stalin represented at least the beginning of the end for the close Roosevelt-Churchill relationship. Despite the grief of sentimentalists, however, Roosevelt was only being realistic. The in­dustrial and military power of the United States had grown to the point that this country and the Soviet Union were both overshadowing Britain in importance. Britain was falling into the background. Roosevelt, a cold man behind his disarming smile, was also growing weary of Churchill's doggedness on all issues. Roosevelt's pragmatic decision to court Stalin represented at least the beginning of the end for the close Roosevelt-Churchill relationship. The distancing between Roosevelt and Churchill first manifested itself at Cairo in the fall of 1943, where the British and Americans met, suppos­edly to prepare themselves for their forthcoming meeting with Stalin at Tehran in late November. To Churchill's disappointment, Roosevelt man­aged to avoid any significant meetings throughout the entire time, using the excuse that he did not want to appear to be "ganging up on Stalin." The president even went so far as to occupy long periods with Chinese president Chiang Kai-shek discussing Far Eastern matters. The rift between the Western Allies became more apparent when the American and British delegations finally reached Tehran. On arrival Roos­evelt accepted an invitation from Stalin to move the American delegation into the confines of the highly protected Soviet embassy. Roosevelt also lunched with Stalin but avoided any such one-on-one contacts with Churchill. Such snubs were painful enough for Churchill, but his distress grew even worse when the official meetings began. From the start, he found himself seen by Roosevelt and Stalin as dragging his feet rather than coop­erating. Stalin and Roosevelt were intent on launching an Allied crossing into Northwest Europe as soon as possible, and they regarded Churchill as lukewarm, even obstructionist. At the end of the meeting, however, the three powers confirmed that the Allies would invade northern France the following spring, with a fixed date of May 1, 1944. Furthermore, that landing would be accompanied by another assault at Marseilles, with seven divisions to be drawn from Churchill's area of hegemony, the Mediterranean. Although Churchill was unhappy about the agreement, he did not con­sider himself quite powerless. No agreement, to him, was beyond further discussion; no decision, until executed, was absolutely final. Roosevelt saw it otherwise. On leaving Tehran in early December, Roosevelt and Churchill, with their staffs, returned to Cairo for a short time. There, on December 7, 1943, Roos­evelt decided to appoint Eisenhower rather than Marshall as commander of OVERLORD the coming spring. The choice made little difference to Churchill, for it had already been established that the Supreme Commander would be American. Far more important to him was Roosevelt's agreement for the commander in the Mediterranean to be a British officer. Roosevelt had attempted to convince Churchill that the Mediterranean and the Eu­ropean theaters should be combined under General George Marshall, but Churchill had rebuffed the notion in no uncertain terms. He considered the two theaters almost coequal. Churchill was now the undisputed generalissimo in the Mediterranean. The Allied Commander, General Sir Henry Maitland (Jumbo) Wilson, was his man. Any resemblance to an orderly command chain in the Mediter­ranean now went out the window. Orders for operations in that region, at least de facto, went from Churchill to his favorite general, Alexander, in Italy, bypassing even Wilson. Never mind the Combined Chiefs of Staff. The prime minister exercised his new power soon after the Allied lead­ers left Cairo and stopped off at Carthage. Confined to his bed to fight what the doctors now diagnosed as pneumonia, he fretted and schemed. After a few days, as soon as he began to recover, he summoned Brooke to come to Eisenhower's villa to consult with him on a new operation in Italy. Impatient with Allied progress toward Rome, he revived discus­sion of a previously rejected plan for an amphibious two-division assault (SHINGLE) at Anzio, near Rome, hoping to force the Germans to abandon their formidable line at Cassino, on the Rapido River. In drawing up his plans, Churchill felt it necessary to deal with only two people. First, he needed to convince General Eisenhower, departing for London, that he could afford the transfer of some landing craft (LSTs) scheduled for OVERLORD. Then, having secured Eisenhower's reluctant blessing, he proceeded to confirm the agreement with Roosevelt. Wilson, the Allied Commander in the Mediterranean, seemed to play no role, nor did the Combined Chiefs of Staff. SHINGLE, Churchill's project, was ex­ecuted on January 22, 1944. Unfortunately, Anzio failed in its intended mission. The German com­mander, Field Marshal Albert Kesselring, did not abandon the line of the Rapido, and the Anglo-American troops under U.S. VI Corps were unable to break out until the following May, 1944, just before D-day in Normandy. British generals prudently have called the operation a success, since it was Churchill's idea. Its main success, however, was reduced to avoiding destruction of the beachhead. By the turn of the year, Churchill was well enough to be moved from Carthage to Marrakech. He then returned to London to take his part in preparations for OVERLORD. During the final stages of planning for OVERLORD, Churchill and Eisenhower, both in London, cooperated much as they had two years earlier. But Eisenhower was now in full charge of OVERLORD, while Churchill still tried to keep as much control as possible in his own hands. Oddly, therefore, his main adversary in the competition for control was his friend Eisenhower. Eisenhower, while flexible in most matters, was determined that he must be given control of the strategic bombers during the first few months before and after D-day for OVERLORD. His resolve grew out of his frightening experience at the Salerno (Italy) landings the previous September, when he had been denied the amount of airpower he deemed necessary. As the result of that close encounter with disaster, Ike had vowed then that he would never again make another amphibious landing without absolute control of the heavy bomber support he demanded. There was nothing casual about that resolve. When they had visited at Marrakech, Churchill had seemed to be will­ing to grant Eisenhower's requirement. Churchill did, indeed, promise to support him--or at least Ike gained the impression that he did. Given Churchill's ability to reverse his opinions whenever he needed to, Eisenhower's impression was probably correct--for the moment. Eisenhower sensed otherwise when he arrived in London on January 12, 1944. A coolness in some quarters, he discovered, had developed against granting him control of the heavy bombers. To his astonishment, he learned that Churchill himself had developed a case of amnesia regarding his ear­lier promises. The resistance did not come solely from Churchill, however. The Combined Chiefs were reluctant to relinquish their usual control of the Strategic Bomber Force. And there were conceptual arguments. The strate­gic airmen believed that Germany could be bombed into submission with­out the need for executing OVERLORD at all. The tactical Air Force men, who believed that OVERLORD was necessary, were in the minority. The matter was finally resolved, but only when Eisenhower hinted strongly that he would resign his position as Supreme Commander unless his views prevailed. The Combined Chiefs granted him control of the heavy bombers from April until September, by which time it was presumed that OVERLORD would be secure. Churchill was not a major player in this controversy, but he doubtless would have preferred the CCS position, where he would retain some influence. Another important controversy grew out of the agreement, made at Tehran, that a landing should be made in southern France simultaneously with OVERLORD. The seven divisions would later come under Eisen­hower's command when they linked up with OVERLORD near Dijon, France. Churchill had never reconciled himself to losing seven top-notch divisions that would come from the Mediterranean. Such a loss, he argued, would cripple Alexander's Italian campaign--a buildup of "American" OVERLORD at the expense of Churchill's lake. Churchill attempted to reopen the issue with Roosevelt, but much to his chagrin Roosevelt considered DRAGOON to be a firm commitment made by him personally to Stalin. Further, Churchill's persistence was wearing thin. The president, therefore, with the concurrence of the American Joint Chiefs, delegated to Eisenhower the chore of representing them in the matter. Unconventional as that action might seem, the prime minister was now forced to present his case to an American general. Churchill argued against the DRAGOON-ANVIL plan without results, continuing all the way to the first week in August 1944, only eight days before the actual landing was eventually made. His position in talking with Eisenhower was weakened by refusal to admit his real reasons for resisting the proposed venture. Instead he resorted to military hyperbole, painting gory pictures of the beaches of Marseilles running red with the blood of Allied soldiers. Eisenhower knew better; his intelligence had confirmed that southern France was nearly denuded of German troops, and moreover the blood to be shed would be American, not British. The landing was made, with Churchill personally witnessing it from a British vessel. The results were far-reaching. Many follow-up American divisions were later landed at Marseilles as the European campaign wore on, as well as enormous quantities of the necessary supplies. And from an Anglo-American alliance viewpoint, it signified that Roosevelt was no longer heeding his onetime close ally. In the spring of 1945 a final issue appeared. After the Americans and British had crossed the Rhine River in late March 1945, Churchill urged Roosevelt to scrap the previous agreements made with the Soviets at Yalta regarding the occupation zones of Germany after the war. To that end he urged that Roosevelt direct Eisenhower to drive straight for Berlin in an effort to take the city ahead of their Russian allies. This was contrary to Eisenhower's plan, however, because he had decided to stop his armies at the line of the Elbe and Mulde rivers. On April 12, aware of Churchill's protests, Eisenhower sent a message to Washington saying that he would, if instructed, "cheerfully" do what he considered unwise from a military viewpoint. But Roosevelt could not take any such action. He died at about the time Eisenhower's message arrived in Washington. The Western Allies stopped at the Elbe. Wartime operations over, Churchill lost no time insisting that the annoying Supreme Headquarters, Allied Expeditionary Forces, be deactivated. The Anglo-American alliance in Europe was at an end. Those, in a nutshell, were the differences between Churchill and the Americans in the Second World War, differences that have often been ar­gued back and forth. It must be realized, however, that they were minor compared with the basic friendship and cooperation that bound two allies. Nor did they dampen the friendship between Churchill and Eisenhower, difficult as Churchill may have found his friend to be at times. They were together shortly before the Potsdam Conference in July 1945, when Churchill was up for reelection as prime minister.tf Churchill, as the dominant hero in Britain, was confident. He mused to Ike that in some ways it might be well were the Labourites, under Clement Attlee, to win, because individually they were not nearly so well fixed financially as was he. But when the election results reached Churchill at Potsdam, he was shocked to learn that he had been turned out of office. Attlee replaced him while the talks were going on, together with Stalin and the new U.S. president, Harry S. Truman. The British had had enough sacrifice, enough "blood, sweat, and tears." They had stuck by their old warhorse during the war, but now they longed for relief from their sacrifices and more do­mestic programs from the British government--and that meant the Labour Party. As for Churchill, though nearing his seventy-first birthday, he did not leave public life. He remained in the political arena for another decade. He reassumed his position as the leader of the Conservative Party and re­sumed the rough-and-tumble of the floor of the House of Commons. I saw Churchill several times after the war. In October 1946 I was includ­ed on the guest list of a dinner given in my parents' honor at Number 10 Downing Street in London. There Churchill and Prime Minister Clement Attlee seemed to be on cordial terms; after all.Attlee had been Churchill's deputy in the coalition cabinet that ran the war. But I was amused by the fact that the radio that very afternoon had reported one of the two referring to the other as "that wicked man." British politics seemed to be a bit more of a game than American. As time went by, the world watched Churchill age, though he stayed amazingly active. At an English-Speaking Union dinner in London in July 1951, he appeared to have slowed down dramatically. He was practically deaf--perhaps he was bored. But later in the same year his Conservative Party regained control of the House of Commons, and Churchill became prime minister once again, serving nearly as long a term as he had during the Second World War. His time in office overlapped my father's presi­dency for about two years. He finally retired in 1955, age eighty-one, just before the four-power conference at Geneva. The most vivid recollection I have of the aging Churchill centers around his visit to the White House in 1959, some eighteen years since he was President Roosevelt's guest in 1941. Several strokes, which he had suffered throughout his life, had crippled him. Hardly able to walk, he could un­derstand almost nothing that was said at the dinner table. When he left the White House after the visit, the entire presidential staff poured out to the northwest gate to send him off in his limousine, the members viewing him half in affection and half in awe. Yet my father and I had the feeling that Churchill had more book proj­ects in mind. After we moved to Gettysburg, I assisted Dad in writing his two-volume White House memoir. At one point, we decided to repro­duce certain exchanges pertaining to Indochina in 1954 that would require Churchill's authorization. The old man declined, using as his excuse that "these matters should remain secret for a while." Our uncharitable con­clusion was that "for a while" meant "until my own book comes out." A couple of years later, Sir Winston Spencer Churchill, finally knighted, died in London on January 24,1965. My father flew to London as the guest of the British Royal Family and made the television eulogy at his funeral. "Half-American and all British," Winston Churchill was perhaps the strongest advocate of Anglo-American unity of anyone in public life. Probably he would have liked to maintain the close ties that had existed between Britain and America for most of the Second World War. In his endeavors to further that cause, he was not completely successful. A con­tinuation of that relationship, the Americans realized, would have served the interests of Britain but not necessarily those of the United States. To adapt his own words, Churchill could be a difficult ally. But it would have been far worse to fight Hitler without him.